In addition to the constant support offered to initiatives and events to raise environmental awareness, Urban Vision has always adopted strict policy guided by the full sustainability of all processes and activities of the company. Active engagement in environmental protection is further confirmed by the partnership that in 2016 Urban Vision tight exclusively with Anemotech for distribution in Italy and England of the zero impact technology ‘The Breath’ . The innovative fabric was chosen by Urban Vision as a flagship product of all its Out of Home achievements. ‘The Breath’ exploits nanotechnology to capture pollutants present In the atmosphere and ensure cleaner air. Placed on scaffolding or on hoarding of construction of urban regeneration and sponsored restoration works, the fabric, exploiting the natural air circulation and without being powered by energy sources, absorbs surrounding contaminants, including mold and unpleasant odors. An environmentally friendly technology, whose potential has been immediately caught by Urban Vision, always attentive to the environmental issue. The Breath won the Sustainable Development Award 2016, designed by the Foundation for Sustainable Development in collaboration with Ecomondo and with the high support of the President of the Republic. The award is annually given to Italian companies that reach significant environmental results through innovative initiatives. 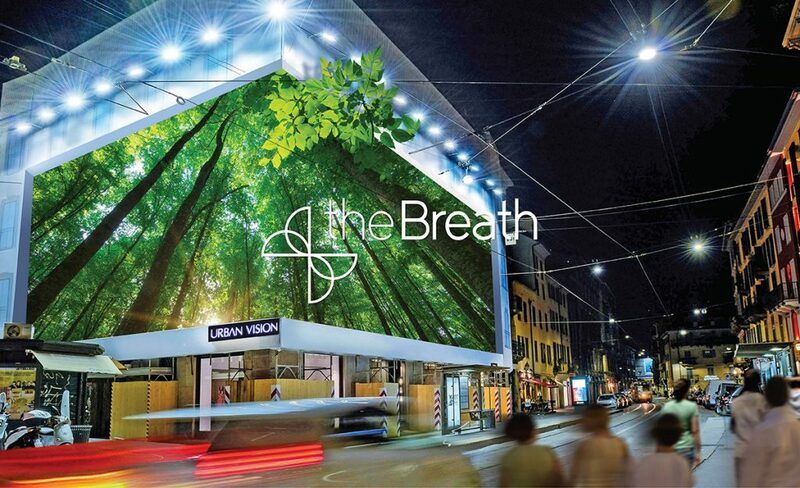 Urban Vision has started an exclusive partenrship with Anemotech for distribution in Italy and England of the zero impact technology ‘The Breath’ .